Here's our full guide explaining how Affinity works in Monster Hunter World. Affinity is one aspect of Monster Hunter World that's never really explained properly, but it can have a massive impact on your hunt, especially if you're taking down a monster on your own. In this Monster Hunter World Affinity guide, we'll be detailing how your Affinity level can impact the game, as well as the best methods we've found for increasing said level. If you instead need anything else on the massive game of Monster Hunter World, including how to safely capture a monster in a trap, as well as how to quickly track down a monster using the Scout Flies, head over to our Monster Hunter World guides walkthrough hub. The Affinity skill is one of the more overlooked statistics in Monster Hunter World, but it can give you the increased chance of landing critical hits on monster and dealing massive damage in a very short amount of time. It’s not just weapons that can boost your Affinity, as certain armor items can also give your character an increased chance of landing a powerful critical hit. Every single weapon in MHW will have an Affinity stat when you first get hold of them from the Smithy. What differs from weapon to weapon is whether this Affinity statistic is a positive or negative percentage. For example, the Insect Glaive Kulu Blade II just below has the Affinity bonus of +10%, whereas the basic Buster Sword I has a 0% Affinity stat bonus. This means that when comparing the two weapons, the Kulu Blade II has 10% more chance of dealing a critical hit to a monster in the heat of battle. You’ll know when you’ve landed a critical hit on a monster when a bright orange number flashes up, instead of the usual grey number. While this might not seem like a massive bonus at first, remember that critical hits have an increased chance of stunning a monster if you hit them on the head, and an increased chance of breaking off parts if you land critical hits to their wings, legs, arms, or tails. Affinity Sliding - Increases your Affinity skill for a short time after you perform a slide. Attack Boost - Raises your Affinity skill while also boosting your attack power. Critical Draw - Increases the chance that draw attacks will land a critical hit. 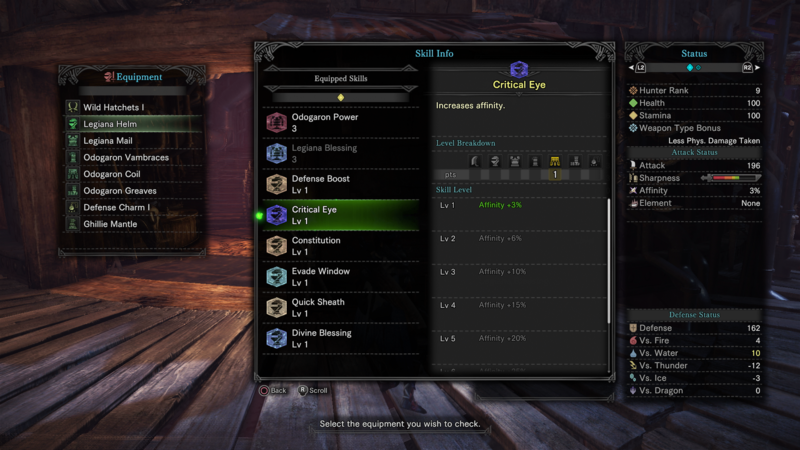 Critical Eye - A permanent increase to your Affinity skill. 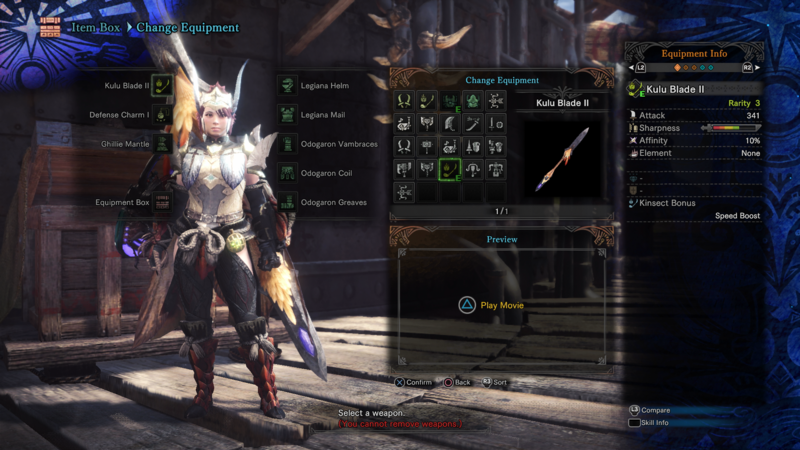 If you want to check the added bonuses that your equipped armor items give you, bring up the MHW pause menu, and to go the ‘Equipment Info’ option. Now press the middle button on the Dualshock 4, or the back button on the Xbox One controller to bring up a complete list of current skill bonuses. You can now see which, if any armor items are currently giving you any of the Affinity skills that we listed just above. We might be all done with our Affinity bonus guide, but why not check out our additional Monster Hunter World guides, including our complete armor guide, as well as Odogaron monster guide.